Facing a loss of up to 35% of their water supply due to invasive zebra mussels, the North Texas Water District needed to construct a pipeline from through Grayson and Collin Counties to their treated water treatment plant in Wylie, TX. To speed design and construction, NTMWD selected Garney Companies as CMAR to build the five section pipeline plus improvements in the plant. AR Daniel Construction Services was selected by CMAR contractor Garney Companies of Kansas City, MO to build the tunnels in four of the five pipeline sections and significant tunneling in the plant. 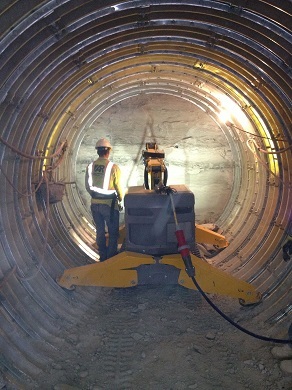 AR Daniel constructed over 3000 lineal feet of 72" - 126" tunnels supported with tunnel liner plate in preparation for the raw water pipeline. 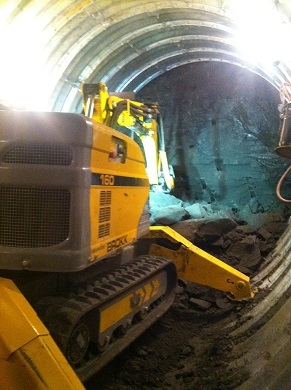 AR Daniel utilized a Brokk 160 robotic excavator to mine limestone and clay tunnels in addition to hand mining techniques. Working with the CMAR Garney, AR Daniel anticipated the needs of four different pipeline contractors to have each tunnel completed prior to the pipeline contractor's needs for the tunnel. Tunnels were constructed under TxDOT highways, railroads, and existing yard piping in the plant.